Home Team Champs is on the horizon and the energy on the track is building at a frenzied pace. As our IL teams begin to shift their sights onto playoffs and champs, those of us at home get the treat of seeing their hard work pay off now. Home team intensity is at an all time high and those lucky enough to be at the temple last home game got to see it first hand. Here, Ramblin’ Wrecker catches up those who weren’t so lucky. You know when the Toxic Shocks and the Apocalypstix take the track that it’s going to be a hard fought game. 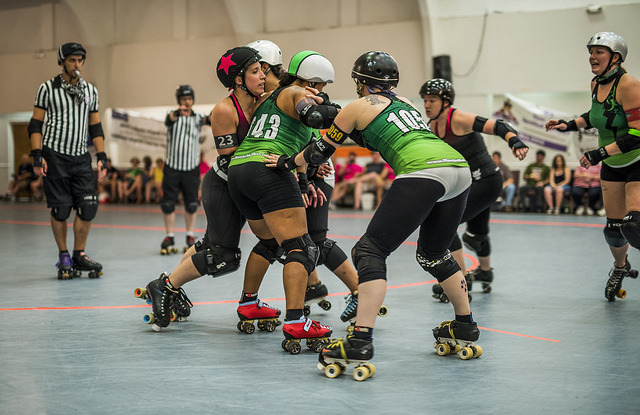 This rematch of the 2016 Championship started with early penalty trouble for the Stix jammers, allowing the Shocks to build up an early lead on two double-digit jams from All-Star jammer Afro Dykee. The Stix quickly climbed back into striking distance with a power jam of their own as Slams McKenzie put up 19 points, but did not take their first lead until the Stix defense forced Evil Olive to pass the star and High Jinxx ran away with 14 points. 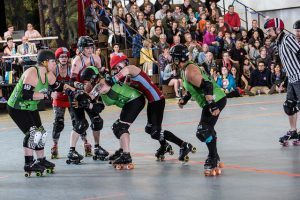 The Stix stretched their lead with big jams from Hermione Danger and 12 Gauge Rage while Madditude Adjustment and Blaque Jac stifled the Shocks jammers. 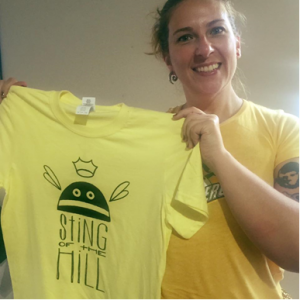 The Shocks found their answer toward the end of the second; getting big points from Fro and Instant Karma while Rebel Yellow, Git Off My Lawn and Owl B Merciless locked down the defense. At halftime it was still anyone’s game, with the Stix holding on to a slim 12 point lead. Both teams entered the second half ready for a battle and found a formidable opponent. The first ten jams saw two lead changes and a tie, with seven jams ending with fewer than five points separating the two teams. That all changed with one monstrous jam from Trouble MakeHer, who put up 28 points in a two minute jam, while the defense forced a star pass and held the Shocks’ pivot-turned-jammer, Git Off My Lawn, to only seven points. Despite earning lead in six of the nine remaining jams, the Shocks were not able to climb back from that deficit. Whenever they got close, the Stix would answer with big points, including another 28 point jam- this one from Hermione Danger. With a slim roster of only ten skaters, the Richland County Regulators had to know that they were in for a tough night when they came to Atlanta to challenge the ARG Jukes of Hazzard. Just how tough became clear the first time they encountered Cancer Candy, Walt Hitman, and the rest of the Jukes defense, who didn’t give up any easy points. Even with multiple power jams and two big scoring runs from Dejennarite, the visitors were down 70-149 at the half. The Jukes only continued to widen the gap as the second half started. 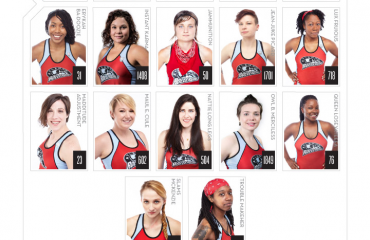 Despite facing off as foes in the Stix/Shocks game, jammers 12 Gauge Rage, Square Ruthless and Hermione Danger united to lead the Jukes’ scoring, racking up an impressive 192 points among them. The night ended on an unfortunately somber note, with an injury to a Richland skater that stopped play with approximately five minutes remaining on the clock. With the outcome of the match already clearly decided, the officials and coaches opted to end the game so the skater could be attended by medical personnel. Be sure to mark your calendars NOW for Home Team Playoffs, where we’ll see a rematch of the Denim Demons versus the Toxic Shocks at 5pm and the Sake Tuyas take on the Apocalypstix at 730. Tickets can be bought online or at the door.